Some at least are not original; some are too thin, and one of the wound bass strings had obviously broken at some point and been reattached with a loop of thinner monofilament wire. Ingenious but probably not very sonorous! But I feel that at the very least, these old strings are rather old and probably reflect the harp’s original stringing regime. The copper-alloy wires have a thick layer of patina on them. So I removed them all very carefully, one at a time, and bagged each one up on a clear zip-lock bag, labelled on the outside with the name of the harp and the string number. This represents the archive of the harp, so that in future the information embedded in its old strings is not lost. I had already measured the strings and worked out a possible original stringing and tuning regime. 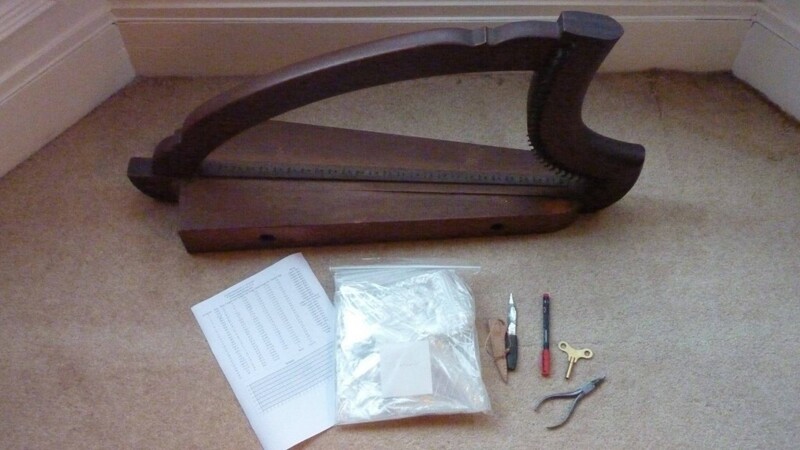 Eventually I hope to put modern brass wire strings on the harp, reproducing the original setup as closely as I can, so we can hear how the harp would have worked when it was new. But first, we need to turn our attention to that soundboard crack. How absolutely fascinating! I have always wondered what a Dolmetsch harp would sound like. I have always been amazed by the Mabel Dolmetsch recordings on your early gaelic harp website, but the poor sound quality of those old 78’s makes it hard to get a good idea of the sound. I hope you find a luthier that can repair that crack. Keep us posted on this little harp- I’m anxiously awaiting more news!